Home > Departments > Faculty > Letina Jeranyama Ph.D.
Letina Jeranyama earned an M.A. in Curriculum & Instruction and a Ph.D. in Education, with a specialization in Science Education, from Michigan State University. She also holds a teaching certificate in secondary science education. 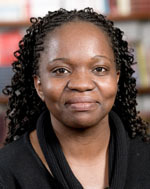 Dr. Jeranyama's interests include scientific literacy for all, school university partnerships, school reform, using embedded assessment to guide teaching & learning, professional development of math and science teachers, promoting scientific literacy for all students, especially those in urban environments, and teaching science for understanding and application. Dr. Jeranyama's clinical work is focused at the secondary level. She works primarily with science, math and art pre-service teachers. She facilitates an on-site seminar for both student teachers and their mentor teachers, as well as bi-weekly meetings for science teachers as the chair of the Hiatt Center Science Curriculum Team. Her current research focuses on using the "rounds" model of teacher professional development instituted at the Hiatt Center. She presented her work on this research to the NARST (National Association of Researchers in Science Teaching) in 2006.